4-20mA Output. 2 Wire Operation. Pressure to 30 psig. 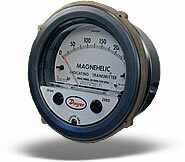 The Dwyer Series 605 Magnehelic® Indicating Transmitter provides for both visual monitoring and electronic control of very low differential pressure. The Series 605 is ideal for control applications in building HVAC systems where local indication is desired during routine maintenance checks or necessary when trouble shooting the system. The easily read dial gage is complimented by the two-wire, 4-20 mA control signal utilizing the time-proven Dwyer Magnehelic® gage mechanical design and Series 600 transmitter technology. The two-wire design with terminal strip on the rear simplifies connection in any 4-20 mA control loop powered by a 10-35 VDC supply. Please see SERIES AT2605 for ATEX approved. Size: 4" (101.6 mm) dial face, 5" (127 mm) O.D. x 2-11/16" (68.3 mm). Weight: 1 lb, 12.6 oz (811 g). Accuracy: See chart (includes linearity, hysteresis, repeatability). Temperature Limits: 20 to 120°F(-6.67 to 48.9°C). Compensated Temperature Range: 32 to 120°F (0 to 48.9°C). Power Requirements: 10-35 VDC (2-wire). Zero and Span Adjustments: Protected potentiometers. Loop Resistance: DC; 0-1250 ohms maximum. Current Consumption: DC; 38 mA maximum. Electrical Connections: Screw terminal block. A-370 Mounting Bracket, flush mount Series 605 Transmitter in bracket. Bracket is then surface mounted. Steel with gray hammertone epoxy finish.